My Father was accustomed to say, "we must begin by the beginning." So, I must begin this lecture about the subject of art by its beginning. But, what is this beginning? I think we have to begin with the oldest questionthe question of being, the question of being as being, of being qua being. What is being? What are we saying when we say something is, something of art is…? Something of art is a joy forever, for example. What are we saying? I begin by a fundamental distinction between three levels of the signification of being. First, when I say something is, I just say something is a pure multiplicity. 'Something is' and 'something is a multiplicity' is the same sentence. So, it's a level of being qua being. Being as such is pure multiplicity. And the thinking of a pure multiplicity is finally mathematics. And finally, the third level is when we are saying that something happens. When something happens we are not only saying that it is a multiplicitya pure multiplicity, and we are not only saying that it is something in a worldsomething which exists here and now. 'Something happens' is something like a cut in the continuum of the world, something which is new, something also which disappearswhich appears, but also which disappears. Because happening is when appearing is the same thing as disappearing. The point is that the relation, the subjective relation between an event and the world cannot be a direct relation. Why? Because an event disappears on one side, and on the other side we never have a relation with the totality of the world. So when I say that the subject is a relation between an event and the world we have to understand that as an indirect relation between something of the event and something of the world. The relation, finally, is between a trace and the body. I call trace 'what subsists in the world when the event disappears.' It's something of the event, but not the event as such; it is the trace, a mark, a symptom. And on the other side, the support of the subjectthe reality of the subject in the worldI call 'a new body.' So we can say that the subject is always a new relation between a trace and a body. It is the construction in a world, of a new body, and jurisdictionthe commitment of a trace; and the process of the relationship between the trace and the body is, properly, the new subject. So when you have to speak of the subject of art you have to speak about a lot of things. First, what is a world of art? What is a world for artistic creation? It's not the world in general. It is a specific world for the artistic creation… ah! the police. So this is the first question. The second question iswhat is an artistic event? What is the new singularity in the development of the art world? Third, what is a trace? What is the trace of an event in the art field? And after all thatwhat is the construction of the new art body? But before all that, I want to clarify by some examples the question of the subject as a relation between trace of an event and construction of the body in a concrete world. And I want to refer to our situation todayto our world todaybecause I think that there are today two subjective paradigms. I can propose that the concrete situation of our world today is something like a war between two subjective paradigms, two norms of what is a subject. The first one is a strictly materialist and monist philosophy of the subject. And what is, finally, a monist philosophy of the subject? It is the affirmation that there is no distinction, no real distinction between the subject and the body. If you want, in the first paradigm, I show… (drawing figure). The first paradigm… the subject is something which is finally identified to the body as such. So the subjective creation as a sort of paradigm is only experimentation of the limits of the body. The subject is something like an experience of its proper limits, an experience of finitude, an experience of the limits of the concrete unity of the body. But finally, what is a limit of the body, a limit of the living body? The strongest limit of the living body is death. So we can say that in the form of the subjective paradigm the subject is experimentation of death as final limit of the body. And I think, for example, that there is something like that in the extremist form of body art. Body art is experimentation, direct experimentation of the limits of the body as exposition of itself. But, in fact, the absolute limit of something like body art is experimentation of death as such; and the real and final experimentation in the field of body art can be to commit suicide in public. And it's a philosophical determination, because a long time ago Heidegger said that finally Dasein or subject is a subject for death. I can name, in general, the subjective paradigm which is experimentation of the limits of the body something like enjoyment because enjoyment is the name of experimentation of death in life, experimentation of the big thing (das Ding) as death in life itself. So we can say that the first paradigm of subjectivity in our world is the paradigm of subjectivity as enjoyment. But in enjoyment we have to hear the French jouissancethat is exactly the same word. And the definition of enjoyment is experimentation of death in life with experimentation of the limits of the body. And naturally enjoyment is beyond pleasure. Pleasure is something like experimentation of life in life, but enjoyment is beyond pleasure because it's experimentation of the limit of the body as death. So we can say that the sort of subjectivity, the paradigm of subjectivity is a subject for enjoyment. And I think it is the Western paradigm today; it is, in fact, our paradigmsubject for enjoyment and the experimentation of the limits of the body. The second one, the second paradigm is an idealistic, theological, metaphysical philosophy of the subject. The subject can be completely separated from its body. In the first paradigm the subject is finally the body itself. In the second paradigm, the subject is completely separated from its body; it is against the subject as subject for enjoyment, the revival of a profound desire of separation, the desire of existence of the subject as separated of its body. The goal is to findin life, in actionthe point where the body is only the instrument of the new separation. And you see, it is not experimentation of death in life as in enjoyment, but it's assumption of a new subjective life by the mean of death itself. So we can say that that sort of subjective paradigm is experience of life in death, which is opposed to the experience of death in life. And we can name sacrifice that sort of subjective experience of life in death. And the contemporary world is a war between enjoyment and sacrifice. And the war against terrorism is, finally the war between enjoyment and sacrifice. But in this war there is something in common. There is something in common between the two paradigms. What is common to enjoyment and to sacrifice, finally, what is common is the power of death, the power of death as experimentation of the limits of the body on one side but experimentation of death as the means for a new life on the other side. So with the war between enjoyment and sacrifice, we have finally confronted the power of death. And there is no real place for artistic creation in that sort of warI am convinced of this pointneither on the side of the power of death as enjoyment neither on the side of the power of death as sacrifice. There is no real opening for new artistic creation. So we have to find a third possibility, a third paradigm. We have to propose something as a new subjective paradigm which is outside the power of deathwhich is neither enjoyment (that is pleasure beyond pleasure and limits of the body) nor satisfaction in the sacrifice (that is enjoyment in another world, of pleasure beyond suffering). We can say thatneither pleasure beyond pleasure nor pleasure beyond suffering, neither enjoyment nor sacrifice. In a much more theoretical framework we can say something like that. We have three possibilities of relation between a subject and its body. Three possibilities. And so, we have three possibilities for a subjective paradigm. The first onereducibility. Reducibility. The subject can be reduced to its body. We can say that we have, in that case, an immanent identity of the subject, immanent identity because there is no separation at all, but complete identification between the process of the subject and the becoming of its body. In that case the normthe final norm is enjoyment, the experimentation of death in life. The second is separability. Separability… The subject can be separated completely from its body. There is, in that case, transcendent difference, transcendent difference because the subject experiments itself in the transcendent world and not in the sacrifice of its proper world. The third possibility that I propose is something like immanent difference, not immanent identity, not transcendent difference, but immanent difference. In that case, the subject is not reducible to its body, so there is something like an independent subjective process. There really is a creation, which is not reducible to the experimentation of the limits of the body. But it's impossible that there exists some separation between the subject and its body. So there is neither separation nor reducibility. And that is the situation of the subject when we can understand it as a process of creation, a process of production, a process, which really organizes the relation between the trace of an event and the construction of a new body in the world. And so we have to find something which is not in the field of the contemporary war between enjoyment and sacrifice. And I think the question of the subject of art is today this questionto find something like a new subjective paradigm, which is outside the contemporary war between enjoyment and sacrifice. And we have a lot of problems to organize in this new paradigma new paradigm, which has to understand completely how a new body can be oriented by a subjective process without separation and without identification. So we have to maintain the distance between the trace of an event and the construction of the body. I show you once more my revendication which is, you can understand now, is a revendification of a new subjective paradigm. Give me a new subjective paradigm. And so you can see that if the subject is completely an identity with the body there is no real difference between the trace and the body. And so, finally, the subject is completely in the world. If you have a complete separation between the subject and the body, the subject is completely on the side of the trace, and so it is completely dependent on the event as an absolute event, an event which is outside the world. So on one side, the subject is completely in the world and it is an experimentation of the limit of the world, and on the other side, it is completely outside the world and so it is on the side of something like an absolute event, and so something as god, like god. Can you understand? So in the two subjective paradigms of the contemporary war we find the subjective process as a complete immanent situation and in distinction with the world, or complete separation and in distinction with the radical absolute event. We can see in the two paradigms that we cannot have something like a real process of production without experimentation of the limits, finally, of death in the life of the world, or you have something like transcendency and religious determination. So the question of the subject of art is really to maintain the distinction between the body on one side and the trace of the event on the other side. And so we have, I think, to solve something like five problems. So it's a criterium of size that I give to you to solve five problems. First one, first problemif really the subjective process as a process of creation is in the field of a distance (but an un-separated distance) between the trace and the body we have to interpret the event as an affirmative one and not as a purely disappearing or transcendent thing. If really the trace of the event is in the constitution of the subject, but not reducible to the body, we have to understand that an event, a real event is something affirmative. And it's a complex question because certainly there is a sort of disappearing of the event, and event is a split, a break of the law of the world. So what is the relation in a real event between the negative dimensionrupture, break, split, as you wantand the affirmative necessity if really an event is not absolute and real event? So we have to think of an event, and for example, of an artistic event, as something like an affirmative split. It's the first problem. The second problem is the very nature of the tracethe trace of an event if an event is something like an affirmative split. What is a trace? And it is a very complex distinction because a trace has to be in the world. The event is not exactly in the world, but the trace has to be in the world. And so, what is the trace? What is the real trace, which is in the world but which is in relation with the event as affirmative split? It's the second big problem. The third problem iswhat is the constitution of the new body? Because naturally we have in the case of the subjective process something like the new body. Only a new body is in the possible disposition to have something new in the creation in relation to the trace of the event. The trace of the event is not reducible to the body, but the body is not reducible to the world. Once more, once more. 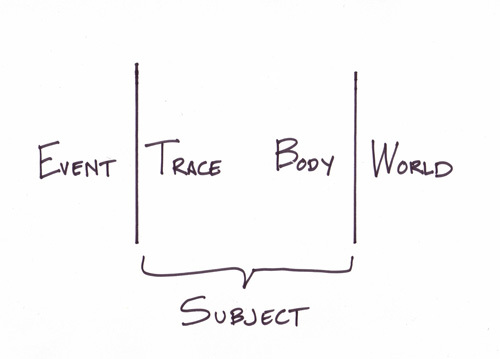 (showing figure) You can see that if the subjective process is really in the distance of the trace and the body, we have to interpret the construction of the body as the new body because if the body is not the new body it is completely in the world and it's not in relation, in complete relation to the trace of the event as an affirmative split in direction of the world. So the third problem iswhat is a new body in the world? What is a new composition of multiplicities? What is really something, which is the support of the subjective process, the support of a trace? That is the third problem. The fourth problem is the question of consequences. We have a new body. We have a relation to the trace of an event, so we have something which is materialist creation, the process of materialist creation of something new. What are the consequences of all that and how can we be in the discipline of the consequences? Because naturally, if there is something new in the subjective process we have to accept the incorporation in the new body and so the discipline of the consequences, of the practical consequences of the new body. And the final problem is to find something like an immanent infinity because if the subjective process is something like a new creation in the world we have an infinity of consequences. We cannot have an experimentation of the limits, precisely. We are not in the first paradigm which is experimentation of the limits. In fact, there are no limits. There are potentiallyvirtually (to speak as Deleuze)we have virtually an infinity of consequences. But this infinity is not a transcendent one; it's an immanent infinity. It is the infinity of the body itself in relation to the trace. So we have to understand what is an immanent infinity and not a transcendent infinity. So our five problems are: event as an affirmative split. What is exactly the trace of an event? What does the constitution in the world of the new body mean? How can we accept the discipline of consequences? And what is an immanent infinity? And that is the questions we have to solve to say something about the artistic subject. First, we have to say what is an artistic world. What is a world of art? Something like that is our first question, our preliminary question. I propose to say that a world is an artistic one, a situation of art, a world of art when it proposes to us a relation between chaotic disposition of sensibility and what is acceptable as a form. So an artistic situation, in general, is always something like relation between a chaotic disposition of sensibility in general (what is in the physical, what is in the audible, and in general) and what is a form. So it's a relation (an artistic world) between sensibility and form. And it's finally a proposition between the split of sensibility, between what is formalismwhat can be formalized of the sensibilityand what cannot. So, it's something like that. (drawing diagram) 'S' is sensibility, 'F' is form, so the general formula for an artistic world is sensibility in the disposition of relation between what is a form and what is not a form. So something like that, very simple. So when we have something like an experimentation of relation of that type between sensibility and form we have something like general artistic situation. It's a completely abstract definition, but you can see the nature of the definition. So, if you want, the state of affairs in the artistic world is always a relation between something like our experimentation of chaotic sensibility in general, and the distinction, which is a moving distinction, between form and inform, or something like that. And so we experiment with an artistic situation when we experiment with something which is in the relation between sensibility, form, and inform. But if this is true, what is an artistic event? What is the general formula for an artistic event? We can say that, generally speaking, an artistic event, a real artistic event is a change in the formula of the world. So it's a fundamental transformation of that sort of formula. So it's something like the becoming formal of something which was not. It's the emergence of a new possibility of formalization, or if you want, it's an acceptance like form of something which was inform. It's the becoming form of something which was not a form. And so it's a new current in the chaotic sensibility. It's a new disposition of the immanent relation between chaotic sensibility and formalization. And we can have something like that, which is, if you want, the eventthe artistic event as an affirmative split. (drawing figure) This time, 'S' is always sensibility, 'F' is form and 'F1' is the new disponibilité of the formalization. And so you have something like that when you have an artistic event. Sensibility is organized in a new way because something which was informthat is, a symbol of negation, we have negation (drawing) yeah?something which was inform, or no formalization is accepted as a new form. So we have here the becoming of inform in something which is formalism and the split is with the new negation of form, which is the negation of F1. So that is exactly the general form of an artistic event as an affirmative split. Why is it an affirmative split? It's a split because we always have relation between affirmative form and negative one. What is formalistwhat is accepted as a form and what is not accepted as a form. So it's a split in the chaotic sensibility between form and inform, but it's a new determination of the split, affirmative split, because something which was in negation is in affirmation. Something which was not a form becomes something like a form. So we are really in an artistic event. Something (showing diagram)… so we can see the affirmative idea of the split is when something which was in the negation, part of the formalist impossibility, becomes affirmative possibility. So we can say that in the field of artistic creation the affirmative split is finally something like a new disposition between what is a form and what is not. And the becoming in a positive form of something which was not a form is the affirmative dimension of an artistic event. What is a body? What is the construction of a new body? A new body in the artistic field is something like a real concrete creationa work of art, performances, all that you wantbut which are in relation with the trace of the event. The trace of the event is something like thatthe declaration always that something really is a form, that something new of the dignity of the work of artand that is the trace. The trace is something like a manifesto, if you want, something like a new declaration, something which says, "this was not a form and it's really now a form." That is the declaration, so the trace of the event. And a new body is something like a work of art, which is in relation with that sort of trace. And often in the field of artistic creation is a new school, a new tendency. There is, generally speaking, some namesnames of a school, names of a tendency, names of a new fashion as a dimension of artistic creationand that is a new body. It's a new body, which is in the world, in the artistic world, in the new artistic world. It's the creation of something new in the artistic world in correlation to the trace. And we understand what is the discipline of consequences in the artistic fielddiscipline of consequences is a new subjective process, is something like really a new experimentation, a new experimentation of the forms, a new experimentation of the relation between the forms and chaotic sensibility. And so it's the same of the new school, of the new tendency, of the new forms of creation, of artistic creation. And the very interesting problem is the final problem: what is, in all that, the immanent infinity? What is the creation, in an artistic subjective field, of a new existence of infinite? I think in the artistic field the immanent infinity is finally something like the infinity of the form itself. And what is infinity of the form itself? It's the possibility that the new formthe new possibility of the formis in relation, in direct relation with the chaotic sensibility. And a new form is always a new access, a new manner, a new entry, a new access in the chaotic of sensibility. And so we can say that in the artistic field the creation of forms is really the movement of immanent infinity, is really an access of the infinity of the world as such. And so we are really in the development of a new tendency, so, of a new body in the artistic field, something like a new development of immanent infinity. It's not only something else; it's a new manner of thinking of the infinite itself. And it is why it is very important today to have something like new artistic experimentation because I think that the political question today is very obscure. I was saying that our problem is to find something which is not in the field of the war between enjoyment and sacrifice, to find something which is really a third subjective paradigm. I think that is the specific responsibility of artistic creationthis searchbecause often when political determination are obscure artistic determinations clarify the situation. And so as a philosopher, I can say to you (and I think a number of you have a relation to the artistic world, the artistic field) there really is today a specific responsibility of artistic creation, which is to help humanity to find the new subjective paradigm. So the subject of art is not only the creation of a new process in its proper field, but it's also a question of war and peace, because if we don't find the new paradigmthe new subjective paradigmthe war will be endless. And if we want peacereal peacewe have to find the possibility that subjectivity is really in infinite creation, infinite development, and not in the terrible choice between one form of the power of death (experimentation of the limits of pleasure) and another form of the power of death (which is sacrifice for an idea, for an abstract idea). That is I think, the contemporary responsibility of artistic creation. Thank you.